Positive Detroit: 'Dining In The D' Has Been Picked Up By Detroit Public Television! 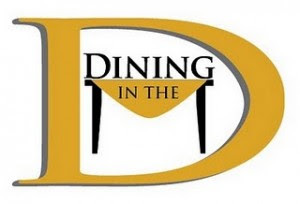 'Dining In The D' Has Been Picked Up By Detroit Public Television! “Dining in the D,” a locally-produced show featuring Detroit area restaurants known for exemplary food, service and atmosphere, will premiere on WTVS/Detroit Public Television/Channel 56 on Wednesday, May 4, at 7:30 p.m.
“After a four-episode run on CMNtv, we’re pleased to be picked up by WTVS to bring a positive show about the Detroit culinary community to a much wider audience,” says “Dining in the D” Executive Producer Michael Whitenack, of Troy. “Dining in the D” will continue to highlight four area restaurants in each episode. Host and chef consultant, Tom Keshishian (known as Chef Tom to viewers), takes viewers from the front of the house to the kitchens and talks with owners and chefs about their restaurants, signature dishes and the interesting stories behind them. “This has been my first foray in TV, and I’ve really enjoyed talking chef-to-chef with some of the truly remarkable talent in the Detroit area,” says Keshishian, of Walled Lake. “There are so many interesting stories about what goes on in these places, especially the food, that foodies can’t get anywhere else. Plus, the owners and chefs we’ve met have made conscious efforts to stay in the Detroit area and have found ways to stay viable and even open during the last few economically challenging years. We believe this is a show that WTVS viewers, and we hope many new viewers, will enjoy. Restaurants featured on “Dining in the D” range from elegant, white tablecloth establishments to everyday family-friendly fare. “Good food doesn’t necessarily mean expensive or exotic food; it’s available at a variety of price points, cuisines and dining styles,” Keshishian says. WTVS has signed “Dining in the D” to a 10-episode contract. The first 30-minute episode will feature Berkley Bistro and Café in Berkley, Lily’s Seafood Grill & Brewery in Royal Oak, and Woodbridge Pub in Detroit. Of the 39 restaurants to be featured in the series, 16 are in the City of Detroit. Underwriting opportunities to support the show’s spring-summer season are available. For more information on “Dining in the D,” visit the show’s website at http://dininginthed.com. For information on underwriting, contact Whitenack at michaelw@dininginthed.com.